What I really think is funny is how stereotypical my children are. I really don't force them to play with "girl" and "boy" toys. Yet Sarah is princess obsessed and is at that age where somethings are boy things and she doesn't want to play with them. Her favorite toy right now (besides coloring, she could color and draw every day all day) is the awesome doll house Grandma and Grandpa Schwartz got her for Christmas. And whenever she's playing with it Cody want to too, and that at times can cause contention because he wants to move his cars into her doll house. But that's a whole other topic. Saturday while Chris was up in the attic working, we were in Cody's room playing I was sword fighting with Cody and she wanted me to play dolls with her. So I asked her to spruce up her doll house while I finished fighting Cody and then she could give me a tour. She showed me around each room. And I was really tickled by her logic. 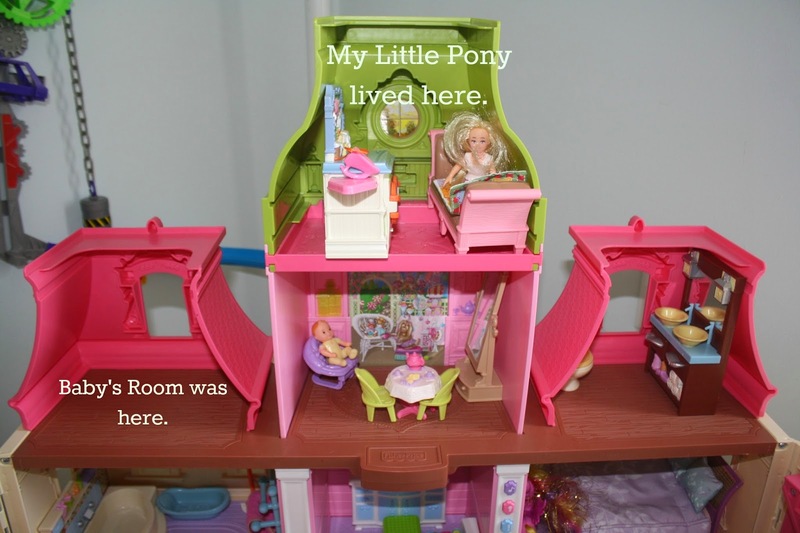 First, I realized that her doll house has more bathrooms then my house. And she even put a stool in one of the bathrooms in front of the sink so the kids could wash their hands. There is a little plate of food on the toilet. I asked her about that and she pointed out there was no table for them to eat at. Though I couldn't get her logic on why she didn't put it on the bed or anywhere other than the toilet. After she gave me the tour I about died laughing at the following conversation her dolls had. The daddy doll came up to the little girl and said, "Sweetie your room is all done." And the little girl said, "Oh thank you daddy! I'm so excited!" And then she proceeded to rearrange the rooms. Sorry the above picture is after the big move. She then proceeded to move My Little Pony who had been living in the attic out. Then she moved all the furniture that was in the middle bedroom up to the attic room, along with the little girl. I thought that was pretty funny because she knows Chris is finishing off our attic and when it's done she'll move into a big girl room upstairs. However, after she moved all the little girl's stuff, she started moving the baby's stuff into the middle bedroom, even though the baby already had a room. I don't know why that tickled me so much but I got a kick out of it. I think I may have told her once that after she moves upstairs Charlie will move into her room. But she clearly remembers it and understands because even though the baby already had a room it still moved into the little girl's room. It's just neat to me how she acts these things out. And Cody is a stereotypical boy. All he wants to do is play fight and must always be armed, generally with multiple weapons. He wants to play fight all the time. Poor Sarah (and Cody), she just doesn't want to play fight. 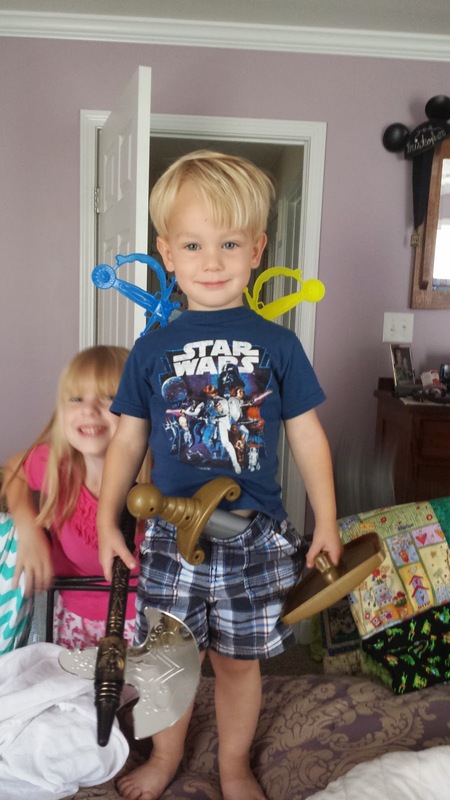 So a lot of time is spent with him chasing her around the house with swords and her screaming, "I don't want to play fight with you." Usually I try to intervene at those moments and fight him off with whatever I have most likely a spatula cause I'm cooking when this typically happens. He's also always climbing, jumping, pewing, and fighting off imaginary bad guys. There is always some epic battle going on in my living room on the couch and in Cody's head. Sorry about the head tilt, I'm not the best cell phone videographer. And yes I know his shirt is on backwards, he threw a fit and insisted the truck goes on the front not the back. His new thing is he likes to have swords down the back of his shirt or tucked into the waist of his pants. After I took this picture I heard him chase after Sarah yelling, "Bow to me!" No idea about that. Boys I guess.